Always keep control, even in mud. Michelin Mud Enduro Competition Line has replaced Michelin Wild Mud Advanced Reinforced. 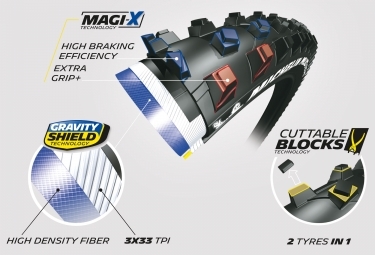 The “Twisted” tread (twisted blocks for mud-clearing and self-cleaning) ensures excellent traction and braking. Maximum grip provided by the tall blocks which dig into even muddy ground. 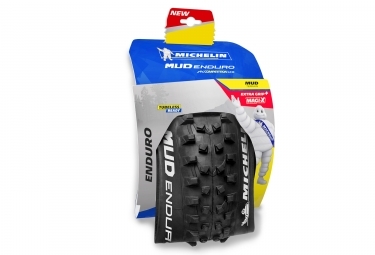 More strength thanks to the strong, lightweight"Gravity Shield" 3x33 TPI casing designed for highly demanding Enduro riding and its high-density reinforcement. Patented cuttable blocks technology for added comfort. robust and resistent tyre, that fits with E-bikes. 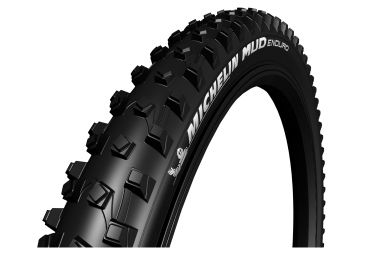 Certified tyres « E-Bike Ready » have been designed to support important load and to last longer, thanks to their robust and resistant carcass.